I am starting to feel that lightness of a life sea-change around the corner. We’ve had an interesting year with many unexpected events. We have done good, hard work, tried our best, made some mistakes, had some triumphs. Then, paralleling all of this life going on, I have been working on an additional teaching certification in educational technology and information literacy for the past year and a half. I just put the wrap on my final project for that sequence last week and I am beginning to let myself dream a little about how I might like to use some of my time that will be freed up. I know I want to cook and write a lot. I want to make huge growth in my photography skills. I also want to get some music back in my life. I’m breathing a little deeply, including the exhales. I won’t start making any concrete plans. Right now, I want to click through these last 6 weeks of school like a pro. Each sector of life has its own checklist to be completed, and using up our food in the freezer and pantry is the thing I can get to right now. The cover of Bon Appetit this month shows a stack of pancakes. That seemed a little odd to me for the May cover. I anticipated something a little springier, like asparagus. I haven’t paid much attention to pancakes since the late 1970s when a few hippy cafes started making whole wheat pancakes. After our kids were past preschool age and especially after we moved to Asia, pancakes seemed too heavy and sweet as a regular choice and there just wasn’t enough food in them to justify all of those calories. But BA added an intriguing caption to the cover photo. It said, “Pancakes worth flying for from our No. 1 hotel.” When I checked the recipe to see what set these cakes apart, I was impressed that they were loaded with a variety of whole grains and they could clearly be adapted in almost infinite ways. I will reprint the recipe here as BA wrote it, but I substituted petite oatmeal for the oat flour, semolina for the cornmeal, and barley flour for the brown rice flour. I also had a couple of packs of dehydrated blueberries from Trader Joe’s and it was time to use those, too. This was an intense looking pancake as the berries turned them a dark color and the semolina gave them a subtle crunchy coating. We liked them. They were tender on the inside, had lots of texture and flavor, and motored me through a busy school morning which is the real test. 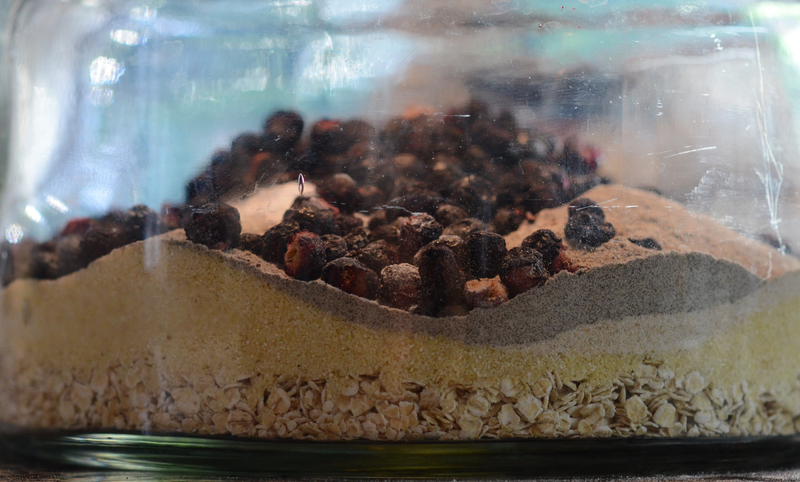 Fast-track this recipe by tripling the dry ingredients and storing them in a jar. At breakfast time, scoop out 2 1/4 cups. All the other measurements stay the same. Alternatively, cook off a double or triple batch and then freeze them, individually, for a quick microwave breakfast.